I have posted many cake recipes on this space like chocolate cake, pineapple gateau, and even cheesecake. Till my good friend S reminded me, I have not observed that I did not post a basic sponge cake till now. Though the brownies I made were enjoyed by both my lil one and J, I could not help but notice the faint expression “I would have enjoyed vanilla cake even more” on J’s face. 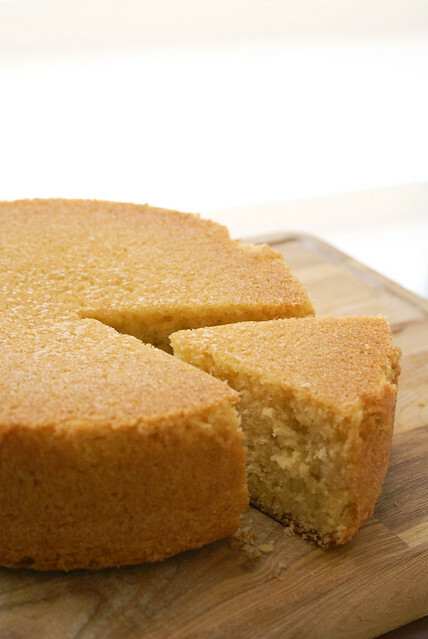 So to fulfill his wish I baked this simple and basic vanilla sponge cake. This can be made with both eggless and with eggs, but for now I am posting the one with eggs. Grease and line an 8 inch or 9 inch round baking tray with a butter paper. Grease the butter paper too, and keep the pan aside. Separate eggs when still cold and cover both the bowls with yolks and whites, with a cling wrap to avoid forming a film on the top. Take butter in a bowl and beat till smooth. Add in sugar and beat well again. Now add the egg yolks, one yolk at a time, beating for one full minute after each addition. Add in vanilla extract and beat well. In a separate bowl, beat egg whites till it forms stiff peaks. Add in the egg white mixture into the butter and yolk mixture slowly and fold in with a wooden spoon till incorporated. Now slowly add the flour mixture in 2 batches, and fold in well. Do not mix vigorously. Pour this batter into the prepared pan and smooth the top with the back of the spoon or a spatula. 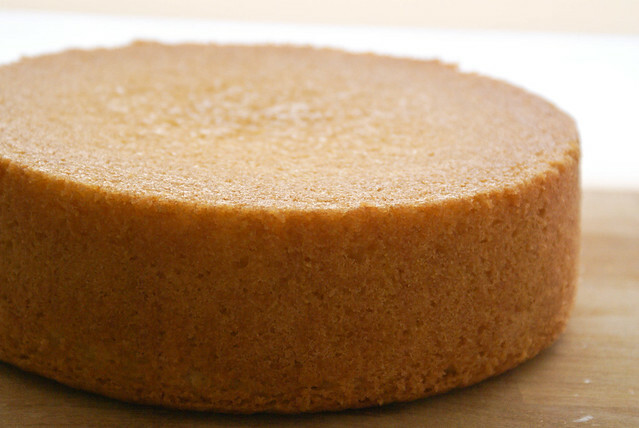 Bake till the toothpick or a sharp knife inserted in the center comes out clean. If the cake startes to brown on the top and is not done yet, cover with a aluminium foil and continue to bake. You can store this cake till 1 week. Enjoy the cake as it is or you can decorate for a special occasion with a butter frosting. Perfect is not the word enough to describe this bake! Wonderful click as well! Hats off! Beautiful! I like how perfect the level is. that’s my mom’s fav cake and one that i ate growing up! This looks lovely. Looks perfectly moist and soft. I think it will be so deliciously with berries and whipped cream. Ah so yum! lovely pics… the sponge looks picture perfect! Yummy and mouthwatering cake. Looks so good. Prefect cake for any occasion…. WOW! love this perfect sponge cake! Nice to know that you tried it 🙂 Love to hear positive response. SIMPLE AND NICE ONE, got nice result as i expected! Wow, so easy to make and yummy. I just baked it and it looks exactly like the picture. Looks amazing…some people add milk, pinch of salt, etc to this receipe..pl advice..how long do we need to pre heat the oven?? Thanks. Pre-heating for 10 – 15 mins is enough. Hi, can I cover this sponge with Royal Icing or Fondant? If I make this without eggs, would it still be soft? What else can I substitute for eggs to retain the soft spongyness. Please let me know. You can substitute apple sauce(1/3 cup = 1 egg) or banana (1/4 cup puréed banana = 1 egg) or buttermilk. Hope this helps. Can you tell me which flour did you use for this cake recipe? I use All Purpose Flour, it is called maida.